As BLUE MURDER begins, we see the life of Jane Lewis undergo major changes. She arrives home to inform her husband of her promotion, to the rank of Detective Chief Inspector, only to find him in their bed with another woman. BLUE MURDER makes no attempts to pull punches. While it certainly is a fictional series, it makes a point of offering up realistic characters and situations. DCI Jane Lewis (played wonderfully by Caroline Quentin) is a real woman. She is a short, round lady with both a sense of humor and a good does of self-confidence. The early episodes of the series finds her working to gain the respect of not just her men, but her superiors as well. While Jane is quite capable, her promotion came in part because she is a woman and the powers that be wanted more minorities in higher profile roles. Jane is, as I said, quite capable and quickly earns the respect of almost everyone. As the series goes on. BM does a fine job of fleshing out the supporting cast. By doing so, the show establishes a strong cast that will keep you coming back for more. Over time, we see the characters change and evolve. Partly because of what they see, but also because of the people they work with. While the stories can be fairly gritty, BM offers a bit of humor here and there. Not so much as to lessen the impact of the violent crimes, but just enough to keep the characters sane. 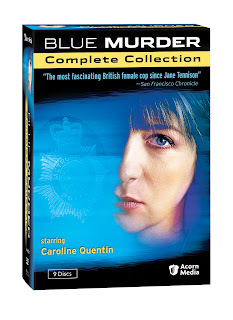 BLUE MURDER is a good series and Caroline Quentin makes the character of Jane Lewis one that you can’t help but want to follow. For those that have not yet climbed on board, here is a chance to snag the entire series. Pick it up and prepare for some damn good television. Order Blue Murder: Complete Collection .